Nobody likes to wake up the morning after a poor night of sleep - assuming there's any sleep to wake up from in the first place, that is. Not getting enough sleep at night can leave you feeling tired, cranky, foggy, and just terrible in general. Poor sleep can also lead to weight gain. Long-term sleep deprivation can even result in cognitive decline. Unfortunately, on top of all this bad news, we have something else to tell you: these aren't the only ways in which poor sleep is having a negative effect on your overall health. Recently, scientists have discovered that not getting enough sleep at night, even if it's just for one night, can have a negative effect on your immune system. So, as it turns out, your grandma was right: of all the million ways she warned you that you could catch a cold, not getting enough sleep is in fact one of them. With cold and flu season rapidly approaching, it is more important than ever to make sure you're getting quality rest each and every night. For more information about the connection between quality sleep and a strong, robust immune system, just keep reading. Unfortunately, there are more serious consequences to a lack of sleep then fatigue and dark circles under your eyes. In the short, medium, and long-term, an insufficient amount of sleep can put your health at risk. For starters, people who don't get enough sleep, even if it's just for one night, are more vulnerable to catching a cold or flu. This is because certain antibodies, such as T-cells, will decrease with each hour of missed sleep per night. So when you are exposed to infectious viruses or harmful bacteria, you're more likely to get sick from it. Depending on your age and how healthy you are in general, this could be anywhere from a nuisance to a serious health risk. Even if you would have gotten sick anyway, having a weakened immune system due to lack of sleep will make your bouts with illness longer and more severe. You could likely end up taking more sick days off of work than you normally would, which may run the risk of causing money problems are creating stress at work. What's more is that your annual flu shot may end up doing more to make you sick than protecting you from disease. This is because some vaccines are created with a weakened virus to make it easier for your immune system to kill it and develop antibodies. But if your immune system is compromised, then that weakened virus is more likely to replicate and infect you then not. Lastly, there's an issue with fevers and poor sleep. 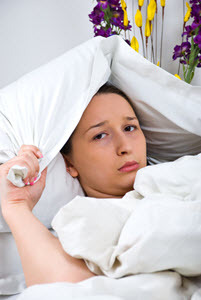 Fevers, although unpleasant, are one of the ways that your body fights back against disease. But fevers have a circadian rhythm, also. That's why most of the time when someone has a fever, it happens at night. But fevers and sleep have an intrinsic connection. So if you're unable to get proper sleep, you'll also be unable to fight off infections with your fevers. This, as we mentioned earlier, can lead to prolonged and more severe illnesses. Recent European studies have identified something previously unknown about how a lack of sleep affects our bodies. Apparently, getting less than 7 - 9 hours of sleep per night triggers the stress response that happens when we get exposed to extreme physical or emotional stress. So even if you lead a stress free (or nearly stress free) life, getting less shut-eye then you should on a nightly basis is still just as bad as suffering from chronic stress. But let's face it: most of the time, if you aren't getting an adequate amount of sleep at night, then it probably has something to do with the stress you experience in your waking life. So not only are you stressing yourself out and doing harm to your body during the day, but you're compounding that stress further by not getting enough sleep at night. This is basically a double whammy. Of course, it isn't just short-term ailments like colds and flus that you have to worry about when you don't get enough sleep. Over the long-term, chronic sleep deprivation can lead to some serious chronic diseases as well. Scientific studies have shown that your risk of obesity, diabetes, and cardiovascular disease all go up when your quality of sleep goes down. Even if you are healthy in every other way, a lack of sleep over time will raise your risk across the board for dying prematurely. So if you want to live a long, healthy life, then your nightly rest needs to become a major priority. Not getting enough sleep at night can leave you feeling terrible the next day; and when you experience a lack of sleep on most nights, you can feel desperate for an immediate and effective solution, like a prescription sleeping pill. But what most people don't realize is that even tiny changes in a person's sleep habits can radically change their sleep patterns for the better. For more information, you should take a look at our report on ways to improve your sleeping habits. Now if any of the sleep hygiene tips we've mentioned before on this website don't work for you at first, don't go rushing off to your doctor just yet. Doctor visits are time-consuming, and the medication they prescribe you may end up doing more harm than good for your sleep cycle. You should wait to take that step until everything else you've tried fails to work. But you can still take your sleep care into your own hands by incorporating a natural herbal sleep remedy into your nightly routine. We highly recommend Avinol PM because of its quality ingredients, effectiveness, and value. You can check out our review on this natural sleep aid, as well as other sleep remedies, on our reviews page.